Caption slip reads: "Photographer: Gaze. Date: 1953-12-01. Reporter: Gaze. Assignment: Santa Monica nativity. 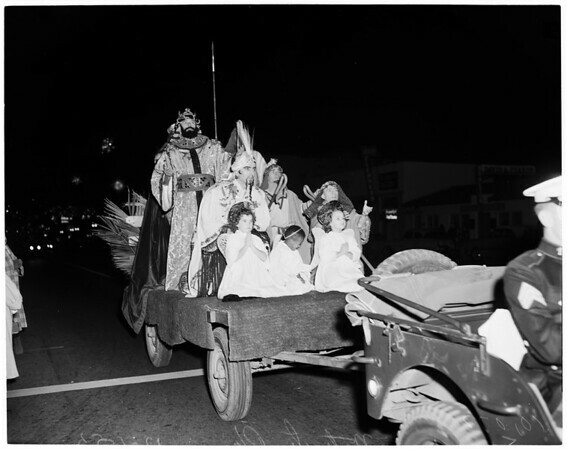 11-12-27-28: View of massed choristers (except 1 shot which shows crucifer in foreground, followed by costumed pages) as procession moves along Wilshire Boulevard to scene of first night's nativity play, opening Christmas season in Santa Monica. 45-46: Scene from nativity play is enacted by players on float in procession. 76: Same as 45-46, different group."